Puri: On the occasion of 20th Foundation day of Odisha-ruling Biju Janata Dal (BJD), party’s president and Chief Minister Naveen Patnaik today shared the basic success mantra to his party workers and leaders. Addressing the ceremony, the undefeated fourth-term CM advised his party members to serve people with ultimate simplicity to win their hearts and trust. 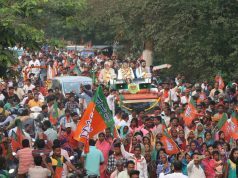 Beginning his speech before a huge crowd with “Jay Jagannath”, Naveen claimed his two-decade-old party has transformed into a ‘social revolution’ and expressed commitment towards serving the people of Odisha. He even thanked all Odias for reposing faith on him again and again. “Simple living and high thinking should be our policy as it connects to the masses and holds paramount importance in public life”, said Naveen. “The former President of India Dr APJ Abdul Kalam had said truth and simplicity are self-maintained without any cost. Hence, I wish that you should all live a simple life and serve people with a sympathetic attitude”, he added. Remembering Father of the Nation Mahatma Gandhi, Utkal Gourav Madhusudhan Das and Utkalmani Gopabandhu Das on the occasion, Naveen said that they have won hearts of the people by self-less service and self-sacrifice. He advised all to follow the footprints of these three legends. The BJD supremo also dubbed the people as their masters and appealed party leaders to fulfill all poll-promises at any cost.